The recent availability of large-scale genotype data has created new possibilities for tracking down genetic risk factors of complex diseases. Extensive data on human genetic variability in healthy and diseased individuals, predominantly in the form of single nucleotide polymorphisms (SNPs), is giving us the raw material we will need to locate genes and genetic variants that are associated with disease. At the same time, though, finding the faint statistical signals in the growing mass of SNP data poses formidable cross-disciplinary challenges. Much recent attention has focused on the use of haplotypes -- evolutionarily conserved sets of contiguous polymorphisms -- as a way of exploiting regularities in the data sets to reduce the dimensionality of the problem. Many questions remain about the nature of this haplotype conservation, how best to use it in disease inference studies, and how effective it will prove in practice. Important areas of active research include developing new methods to gather SNP and haplotype data, characterizing the haplotype structure of the human genome, improving the design of disease association studies, and enhancing their statistical power. Promising approaches to these problems are currently emerging from a combination of new methods for gathering genetic polymorphism data, better understanding of the biological basis of genome structure, sophisticated statistical techniques for finding meaning within these data, and advanced computational methods for inferring genetic structure and applying it to various related analysis problems. This meeting will focus on current research at the intersection of genetics, computer science, statistics, and related fields in gathering and analyzing SNP and haplotype data and applying it to problems in medicine and basic research. 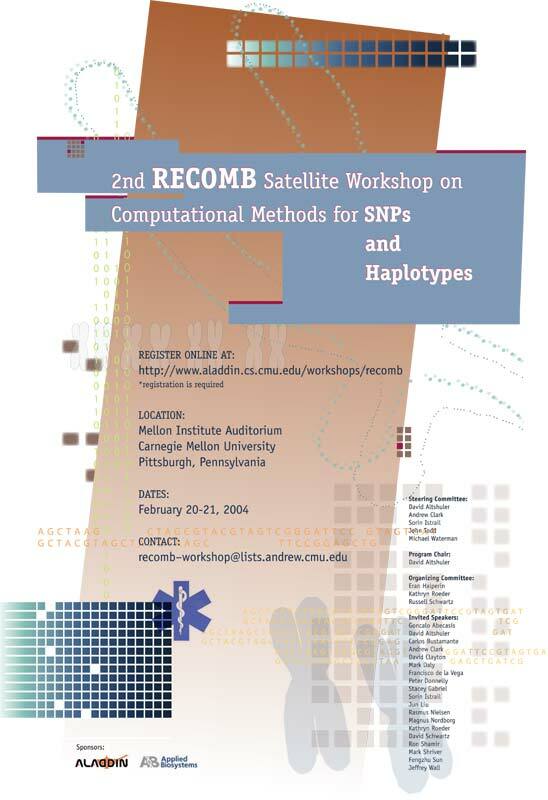 We plan to build on the success of the first RECOMB Satellite Meeting on Computational Methods for SNPs and Haplotypes in bringing together leading participants from widely divergent backgrounds to share their expertise and results. The recent availability of large-scale genotype data has created new possibilities for tracking down the currently elusive genetic risk factors of many complex diseases. Extensive data on human genetic variability in healthy and diseased individuals, predominantly in the form of single nucleotide polymorphisms (SNPs), is giving us the raw material we will need to locate genes and genetic variants that are associated with disease. Much recent attention has focused on the use of haplotypes --- evolutionarily conserved sets of contiguous polymorphisms --- as a way of exploiting regularities in the data sets to reduce the magnitude of the problem. Many questions remain about the nature of this haplotype conservation, how best to use it in disease inference studies, and how effective it will prove in practice. Original research papers (including significant work-in-progress) or state-of-the-art surveys are solicited in all aspects of SNP and haplotype analysis and applications to medicine, including, but not limited to: - New methods for gathering genetic polymorphism data. - Understanding of the biological basis of genome structure. - Statistical techniques for the analysis of the data. - Computational methods for inferring genetic structure. - Applications to disease association and to medicine. - New genotype and haplotype data sets and their analysis. Any questions regarding this workshop should be emailed to recomb-workshop@lists.andrew.cmu.edu. Your submission must be received in electronic form by 11:59pm (PDT) of December 6, 2003 for your submission to be considered. Due to the short turnaround time for reviewers, we will not be able to make exceptions to the deadline. Accepted papers will be compiled for a volume of Lecture Notes in Bioinformatics. Please prepare manuscripts according to the LNBI author specifications. Papers should be at most 10 pages long, excluding title and abstract. If necessary, additional clearly marked appendices can be included but may not be read in review, at the discretion of the reviewers. - Admission to all workshop sessions. - Continental breakfast, lunch, and morning and afternoon coffee breaks. 4. "On the Complexity of Haplotyping Via Perfect Phylogeny"
5. "The Incomplete Perfect Phylogeny Haplotype Problem"
9. "Bayesian Haplotype Inference via the Dirichlet Process"
We are holding hotel rooms for out-of-town visitors at the Holiday Inn Select, 100 Lytton Avenue, Pittsburgh, PA 15213. To take advantage of the pre-negotiated rate of $95 per night ($108.30 including taxes), you should call the Holiday Inn at 412-682-6200 by January 29th to make your reservations and be sure to ask for the RECOMB haplotype meeting rate.